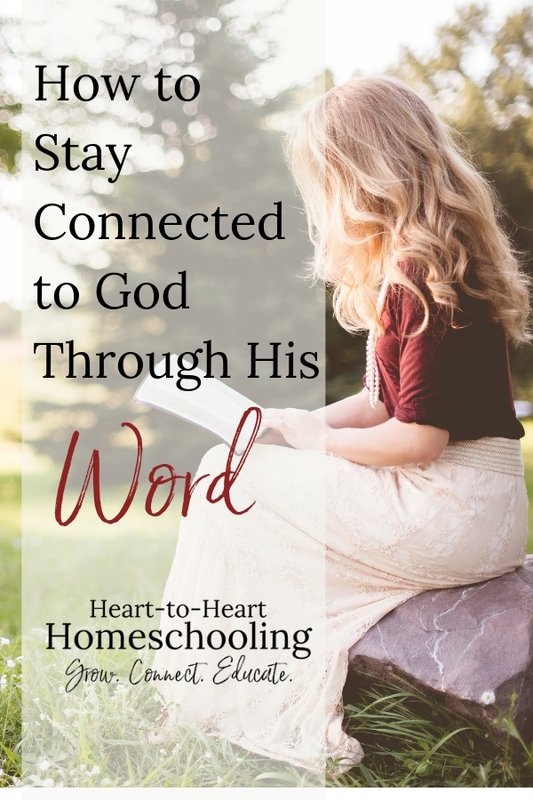 We need God’s wisdom for this homeschooling journey, but more importantly we need Him! God gives us many ways to connect with Him in a personal relationship. Whether prayer, Bible study, a community of believers, or a combination of all three—we have the opportunity to draw near to Him. When we do, he draws near to us (James 4:8a). Let’s strive to be in His Word, wrapped in prayer. Let’s do this individually and in community. We are going to look at each of these over the next few weeks—connecting to God through prayer and community—but today we will begin with His Word. The Bible does tell us who we are and what we should do, but it does so through the lens of who God is. The knowledge of God and the knowledge of self always go hand in hand. So let us connect with God through His Word. So that I can check it off my spiritual “to do” list? Because I believe that it is what “good” Christians do? In order to be seen a certain way by others? So that I will have the answers and people will be impressed with my biblical knowledge? Because I believe that if I do, life will turn out the way I want it to? Or God will give me a formula and guarantee that my children will follow Him? So I won’t feel guilty? To know God and His character? To understand how He wants me to live? To be equipped to walk in a manner worthy of Christ? To reveal sin in my life so I can confess and repent of it? To teach me so I mature and reflect His character to others? Let’s be honest with both God and ourselves. If you find your motives are from the first list, then confess it to God. Repentance means to change one’s mind. Come humbly to His Word and let it transform your thoughts and motives. Ask Him to help you fall in love with Him and His Word. We are all susceptible to this! Pray during each encounter with His Word. Then study it. Even when our motives may be selfish, guess what? The answer is the same: study His Word. The Holy Spirit works through the Word to guide, teach, and convict us of sin. As God transforms us and the thoughts and motives of our hearts, we will fall more in love with Him—our gracious and good and loving God. Jesus said these words to a few of his disciples. He asked them to watch and pray as He faced the climax of His very mission on earth, death on a cross. But they kept falling asleep. Did they love Him? Did they want to do the right thing, what He had asked them to do? I believe they did. Did you catch that? Thanks be to God. He will help you in your weakness, his grace is sufficient. Remind yourself: I’m an imperfect person loved by a perfect God. I may be a mess, but He is sufficient. When I am weak, He is strong. You don’t have to spend hours each day studying the Word. Give Him what you have. Jesus used the following story to illustrate this principle. The context, of course, is in relation to giving money. But I believe we can also apply it to our time as well. And, please, dear mama, give yourself some grace. If our perfect God gives you grace, don’t you think He would want you to do the same for yourself? If you miss your time for a day, a week, or whatever–push the reset button and just go to Him. Take the time to do this. The average lifespan of a woman in the US is about 80 years old. Write down your age, subtract it from 80, and then multiply that by 365. If God allows you to live for the average number of years, how many days do you have left? More importantly, what will you do with those days? Will you invest in the most important things? Evaluate where you are spending your time. Ask God to show you where you may need to make some changes so you have time for the most important things. This will look different in different seasons of life, but dear mom you need your oxygen! He is your very breath of life. Be creative about when you dig into His Word. I love the morning, but there are seasons when that just isn’t possible if you don’t want to get up at 4 am. Maybe nap time works better for you, maybe you are more alert in the afternoons or evening. The time of day doesn’t matter, the time does. Make it a part of your homeschool day. Connect with God right alongside your kids. Yes, it may be a bit more distracting, but it will benefit your kids as you model that your relationship with God is a priority for both you and them. Create an environment that inspires you. Experts in productivity tell us to create a workspace the inspires, that we want to be in. The same is true when it comes to studying the Word. A space and atmosphere that we want to be in motivates us to make it happen. That may be a comfy chair for you, or outside on the porch, or at a desk. It may change according to the time of the year. If you can’t dedicate one space, use a tote to put your study material in and take it wherever you go. Have you ever just opened your bible to see where it lands? Do you sometimes reach for it with no plan on what you will read? We have all done it, but it probably isn’t the most effective approach. Have a plan, and I can guarantee you will get so much more out of your time in the Word. You do not have to have a lot of fancy resources and materials to study God’s Word. All you really have to have is a Bible. Add an inexpensive spiral notebook and a pen and you are set. Please, don’t ever let not having the money to spend on extras keep you from digging into the Word for yourself. Study Bible, commentaries, concordance, etc. S.O.A.K. stand for Scripture, Observation, Application, and Kneeling in prayer. Courtney at Women Living Well has a great explanation here. If you have ever used copywork for teaching language arts in your school, you’ll understand the power of this method. Writing the Scriptures forces us to slow down and notice the details. Candace provides great resources on her blog, His Mercy is New. Check it out here. Heidi St. John of The Busy Mom also shares some great plans here. You don’t have to be a writer or an artist to do this! Journaling provides a way to get your thoughts about the Word onto paper. Dr. Ruth Beechick has said “Writing is thinking.” I love that. Writing—Check out A Modern Girl’s Guide to Bible Study by Jen Hatmaker. Journaling the Word–Pinterest and Instagram may inspire you. If you enjoy drawing, lettering, using stickers or stamps or paints, go for it! Or if you are like me, just simply record your thoughts and what you are learning in the margins of the Bible. I love the the studies by Cynthina Heald in particular. Some of my favorites include Becoming a Woman Whose God is Enough and Becoming a Woman of Simplicity. Behold Your God by Myrna Alexander is also great! The inductive study method is by far my favorite way to study the Bible. You can download a guide from Precepts Ministries here. 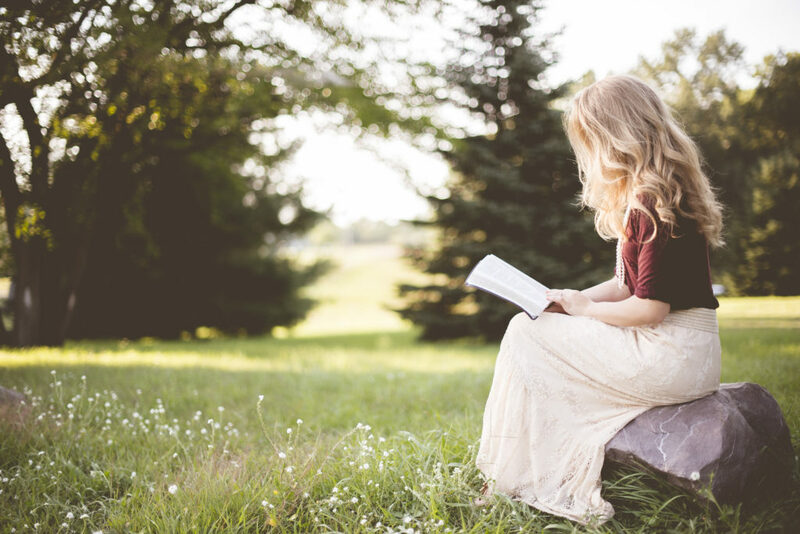 Several great books on the method include Women of the Word by Jen Wilkin, Unlocking the Scriptures by Hans Finzel, and Living by the Book by Dr. Howard Hendricks. Simply write scriptures on notecards and hang them where you will see them. Place them above the kitchen sink, in the laundry room, where you teach you children, or your bathroom mirror—anywhere you spend a lot of time. Then read, meditate and memorize those Scriptures as you go through your day. Just read it! You can find read the Bible in a year plans, Bibles that are divided by daily readings, or you can just simply pick it up and read. One of my favorites for reading is the She Reads Truth Bible. It is a beautiful Bible, written in an easy to read translation, with reading plans at the beginning of each book and devotionals throughout. If at all possible, find a group of like-minded women and use any of the methods above to study the Bible, and come together to pray and teach one another. Wherever you are studying the Bible, at whatever time of day it is, always start with prayer. Pray when you start, pray as you study, and pray when you finish. The Holy Spirit is our guide and teacher! Mix it up or combine some of the methods listed above. But whatever you do, do something! Let the Holy Sprit guide you and make it your own. You will never regret it! I want to give you a chance to meditate on the truth, of who you are in Christ. You can download a FREE 25 page devotional study and journal: Who I Am in Christ: A Scripture Writing and Prayer Journal. So much content shared! Thanks for such an encouraging post to get me back into God’s word! This is encouraging and a great followup from the online retreat! Thanks for all the great ideas. You are welcome! Ana did a great job putting on the retreat. She has such a heart for encouraging women. What a great post Kay! I use the SOAP method for my study time. I love that it is so straight forward and simple and gives me a consistent framework to keep it simple. It also doesn’t take very long which is awesome these days because carving out any quiet sit down time is really challenging in my house right now. Always pray first before you read Scripture. That was you are aware of the Holy Spirit’s presence while you read and you are ready to see HIm in the passage. Absolutely 🙂 Thank you for sharing!